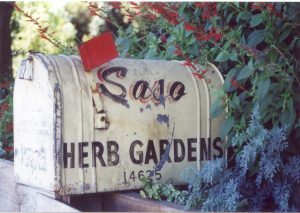 While growing up in the Saso Herb Gardens, I cultivated a natural love for gardening, and growing scented herbs and flowers. Working along side my parents, Louie and Virginia Saso, I learned the art and techniques of growing, propagating and harvesting many types of herbs and other plants. Inspiration for my wreaths and other herbal creations, began while learning herbal crafting from my mother. My time in the Saso Herb Gardens, will always hold the most wonderful memories of hard work, an education and the abundant harvest of herbs, vegetables and fruit.